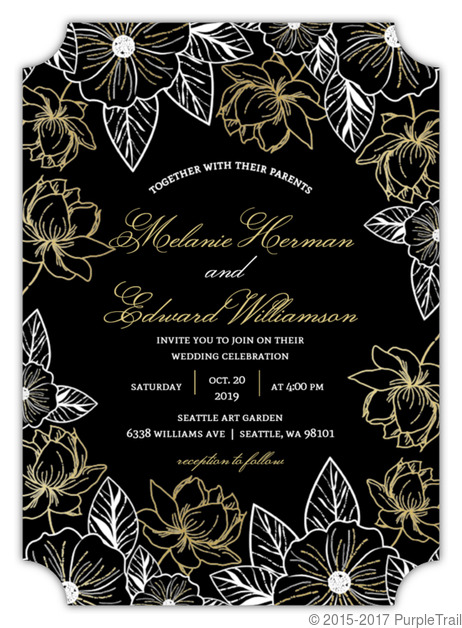 Black and white wedding invitations or black wedding invitations which have a touch of other colors is very popular these days. There is a lot that can be said for these invitations. They are simple, yet stylish. They can be worked into any wedding motif or style from the traditional to the modern, from the casual to the elegant. These invitations really go with everything. 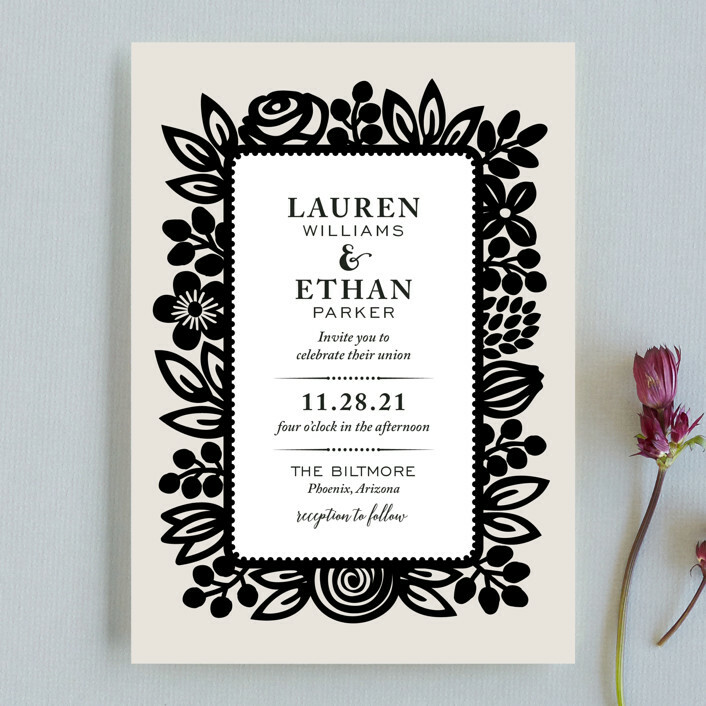 The black and white color combination is becoming more and more popular for weddings these days. 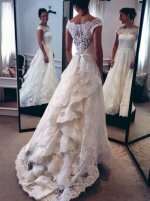 Whether you are looking for a modern affair complete with black bridesmaid dresses and only a touch of color in the decorations or if you are looking for a more traditional wedding look without all the pastel colors and bright decor. 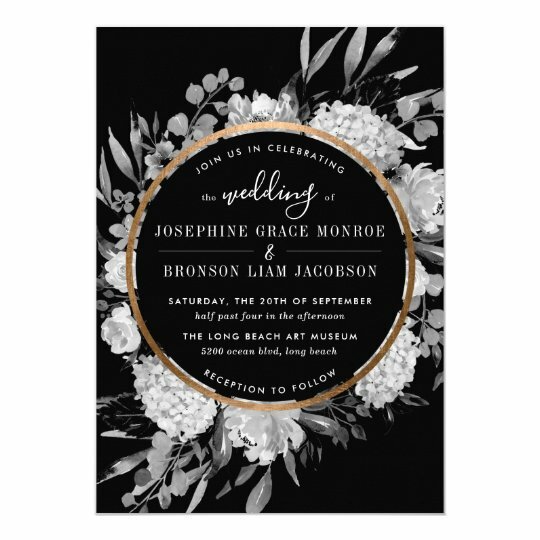 Black and white wedding invitations will fit in with any wedding you plan. These days wedding stationery comes in many different designs and have many different accents as well. Let's Look at some of the different styles available. Looking for something lavish and beautiful? Nothing quite screams glamorous like art deco inspired elements in your wedding. 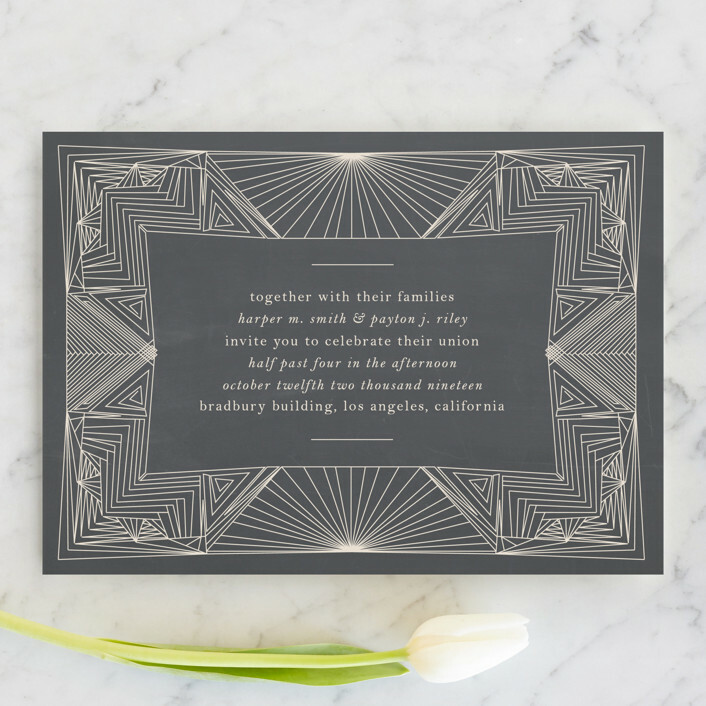 You can use art deco in your wedding stationery, your decorations, centerpieces and even the jewelry you wear. This design is perfect for big events like large weddings, weddings that are intertwined with other celebrations such as holidays and for weddings that are bold and daring in their choices of design and luxury. 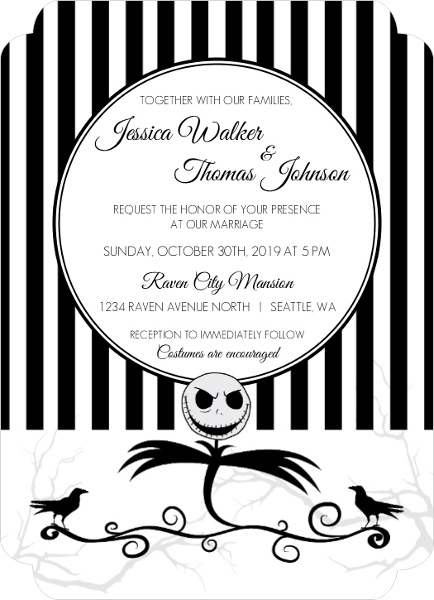 Just because black and white are the main colors, this does not mean you can not incorporate some floral accents into the invitation. You can still only have black and white or you can choose an invitation with those colors being the main colors and have accents of other colors. 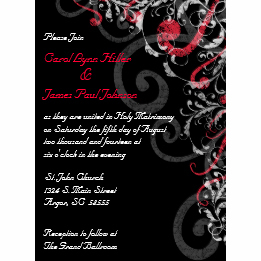 Floral wedding invitations are pretty popular and they have many different styles. Some include having the flowers be the border of the invitation, have flowers big and bold on the stationery or just a few small floral accents. 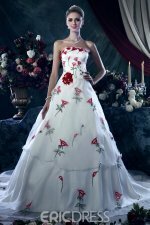 The numerous styles available will allow you to choose something that is more your own style and also fits the rest of the decor for your wedding. Using stripes in the wedding invitations is also a popular theme. Stripes can be traditional or modern depending upon the style you select. 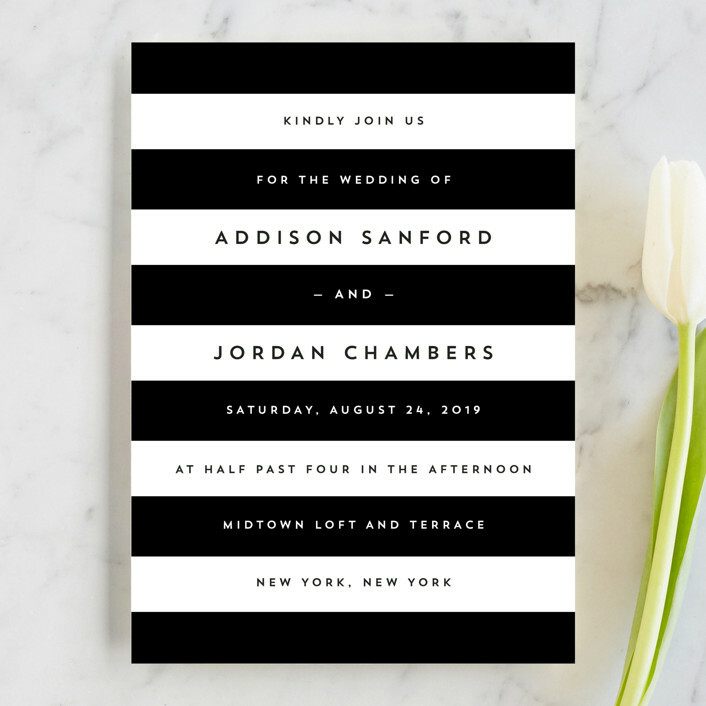 Black and white stripes are a great way to incorporate the color scheme into the wedding stationery without it being boring or bland. If you are interested in black and white but do not mind other colors blending in as well you can choose black and white stripes with a different color font, or a black font with white and another color stripe. There are many different ways you can go with this design choice. 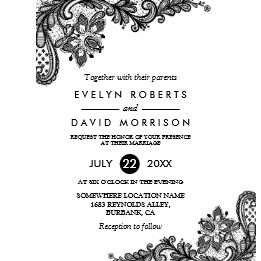 Another popular way to incorporate different style elements into wedding invitations is by using borders. You could have a white invitation with a black border or the other way around. Borders are a lot of fun because there are so many different border designs to choose from. The basic border may just be a line around the invitation. You could also have more decorative borders such as floral, polka dots, art deco designed borders, elaborate scrolling and more. With borders you can go traditional with scrolls or lines or go so much more modern with lights, stars, polka dots or geometric designs. The choice is yours. 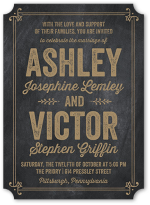 One of the more popular black and white wedding invitation designsthese days is the Chalk board design. 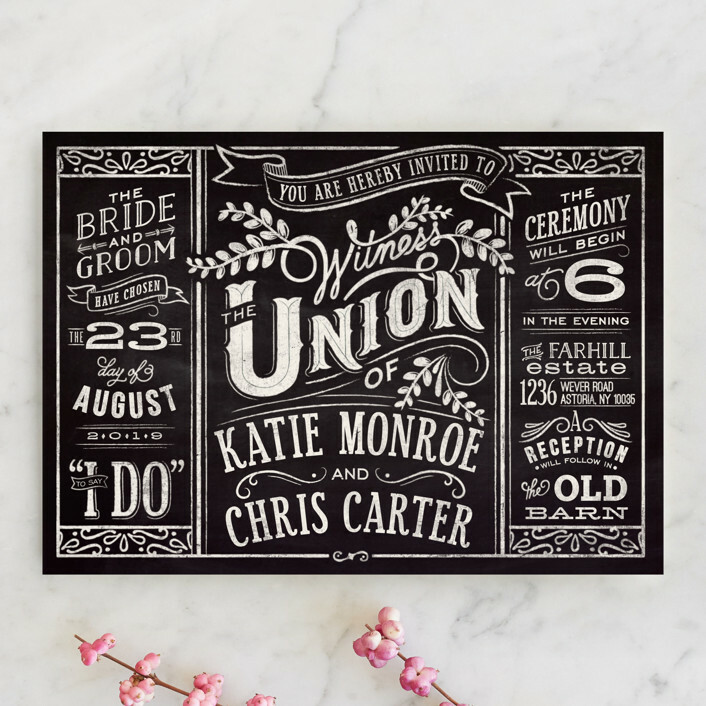 The invitations are meant to look like they are written on a chalk board. This type of stationery is fun and modern and it allows you to use a bolder design as well as a bolder choice of fonts and writing sizes and styles. If you are looking for something traditional this is probably not the way you want to go. However if you are looking for something fun and memorable you might want to use this one. Now with this design you may also be able to incorporate this in your wedding. 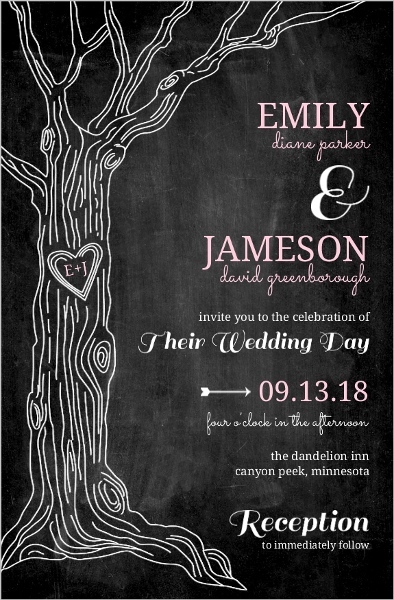 For instance, you could have a chalk board outside of both the ceremony and the reception announcing your wedding, you could use that element at other parties that lead up to the big day as well! Still looking for more ideas? 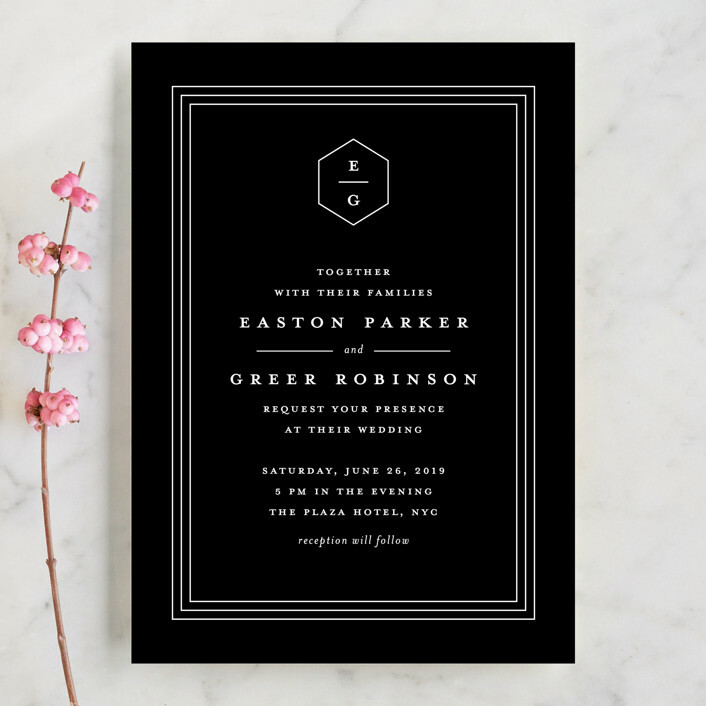 Another popular black and white stationery design is having stars or lights or even polka dots on the invitation. 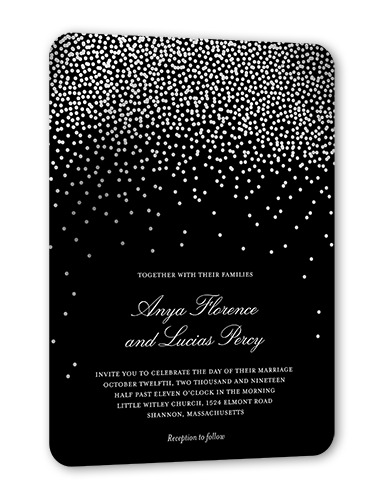 With these type of invitations the main color is usually black, the font is usually white and the element (polka dots, lights, stars, etc.) are either white or another color – pastels and metallic colors are pretty popular here. 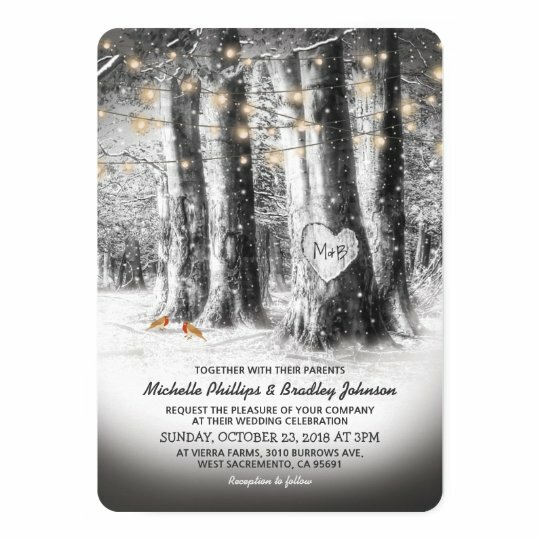 These invitations are usually either fun and fresh or romantic in nature. 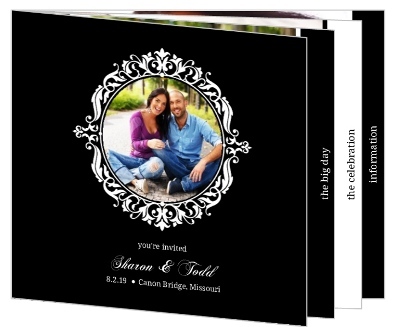 As you can see there are many different options when searching for black and white wedding invitations. Of course those are only some of the main patterns you see over and over, that does not mean those are the only choices. 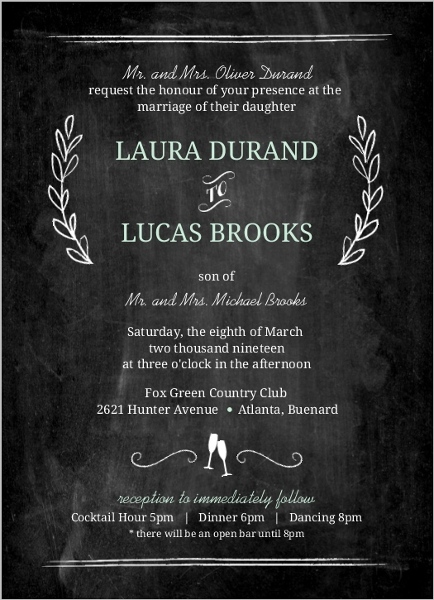 You should think about what you want your wedding invitations to look like. If you already have a pretty good idea about your wedding design, decor and decorations you can match your stationery up to that plan. 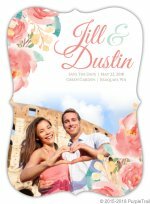 Remember the wedding invitations is one of the first places your wedding guests will be able to get a feel for what the wedding itself will be like. Also, when shopping remember that wedding stationery will be a keepsake for years to come for both you and all your guests. These might be considerations for you before making the final decision on the stationery to choose for your wedding.